This Saturday's cartoons were published on March 18, 20 and 22 (2), 1907. 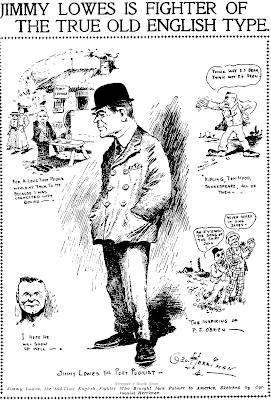 The top cartoon commemorates a visit by British boxer-turned manager Jimmy Lowes, who was representing Jack Palmer, a not very impressive looking young Brit who was the British Heavyweight champion at the time. Next up we have what probably came off Herriman's drawing board as a really great editorial cartoon, but the paper printed it way too dark so the names and the outlines of the fish are barely discernable. 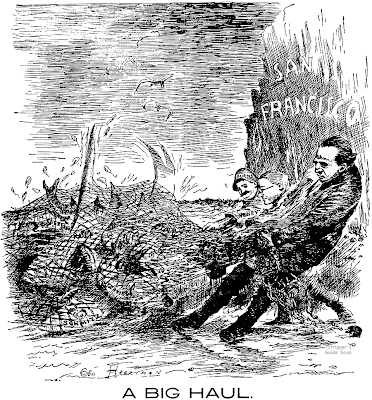 The cartoon comments on an absolutely amazing trial that was going on in San Francisco at the time -- read the details here. The final two cartoons provide updates on the local graft case and it's heating up. The Examiner, at least to hear them tell it, has forced the DA to bring charges against some in the group. How this road graft brouhaha has come to involve a pair of telephone companies and the "boxing trust" (see bottom cartoon) I'm afraid I'm at a loss to explain. Here's a special obscurity for July 4th. Usually these darn holidays sneak up on me and I'm caught with my pants down running something totally inappropriate. Well, it happened yet again but luckily I just happened to have Heroes of Democracy sitting in the pipeline. This World War II patriotic strip tells the stories of real American heroes, including that of Arthur Wermuth whose story would only become more and more incredible as the war raged on (visit the link). This daily strip was an oddball, published by Hearst but not syndicated; it apparently only ran in the Hearst-owned papers. The strip ran March 9 to August 29 1942, a period when Americans needed all the heroes they could come by. A 1943 Big Little Book titled Fighting Heroes collected material from the series. Stookie Allen, the creator of the feature, is a fellow I'd sure like to know more about. From the thirties through the fifties he created mostly fact-based features like this one; he also worked in pulps and comic books producing the same sort of material. Most of his features seemed to tout his name as if he were a celebrity though none of his newspaper work appeared in many papers. Did he have some claim to fame that merited the star billing or was he simply a good self-promoter? After a quick search on Google I stumbled on a page that had some war-time art of Lt. Stookie Allen, gotta be the same guy. Yes, Lt. Stookie Allen is the same person. At the time he was married to Gladys Parker, well known for her comic strip Mopsy. My father, Col. Robert Erlenkotter, commanded the Engineer Construction Group to which Lt. Allen belonged. Here's a title that's a mouthful, but it certainly does a fine job of summarizing the plot. Jack Farr would pick a famous person from history, drop him or her into the present and see how they'd fare. Not well it seems. Farr imbued the proceedings with a fine sense of screwball humor, a trademark style that should have served him better in the newspaper strip world. Yet he always seemed to be jumping from paper to paper, and in the 1920s ended up providing bulk lots of comic strips to the US Feature Service, a company that mostly dealt in buying up old stock from other syndicates. What the problem was for Jack I dunno. He always seemed to be one great idea away from making the bigtime. 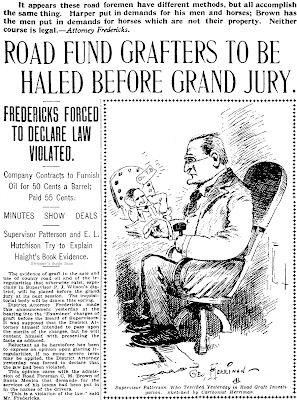 This series ran in the Sunday New York Herald from March 17 to August 11 1918. Hey! I'm a highschooler trying to put together a website on old comics history and stuff like that. I just wanted to thank you, your site has been a big help. I would be very interested in any additional information you have regarding "Jack" Farr. He was a not-so-distant cousin of mine. His given name was William Gordon Farr, Born 18 Oct 1889 in Brooklyn, New York. His parents were William H. and Julia Ann (Munro)Farr. I'm afraid I don't know much about Jack other than his list of credits. I surmise from all the jumping around he did, and his working for grade-Z outfits in the twenties, that he may have had some personal demons of some sort. Did they keep him from the loftier positions that his talent would seem to have entitled him? Seems so to me. Thanks for the full name and birthdate. Do you know when he died, or what he did after he got out of the newspaper strip game? When we talk about editorial cartooning we often indulge in the discussion of the 'importance' of a given cartoonist. 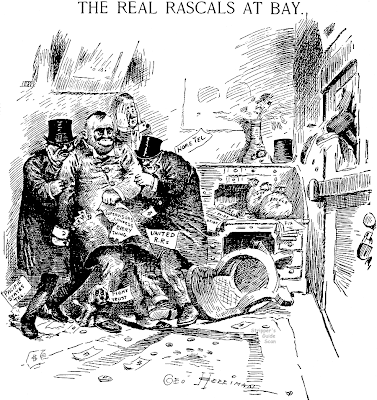 We all know that Thomas Nast was instrumental in bringing down Boss Tweed, for instance. We say, then, that Nast was important, most likely the most important cartoonist of the 19th century, because his cartoons had a direct measurable effect on the world. In the 20th century we had a number of editorial cartoonists that typically get the 'important' tag -- Rollin Kirby, Robert Minor, Herblock, Garry Trudeau, Arthur Szyk, and so on come to mind. But if we're really honest and admit that all these cartoonists did much less to shape popular sentiment but rather are celebrated for their skillful reflection of it then we are left with just one name. Bill Mauldin changed our world. There's just no getting around it. Mauldin showed America the reality of war, and we've never thought about it in the same way since. Until Mauldin war was a star-spangled adventure, brave young men donning dashing costumes to go off and make the world safe for democracy. Yes, some of those young men died, but we knew they sacrificed themselves willingly, joyfully, for the greater cause. War was about great battles, derring-do, flag waving and chest beating. 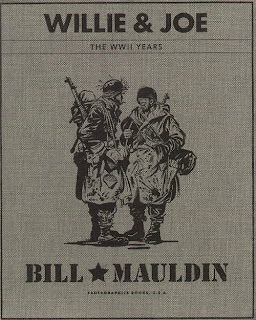 Mauldin showed us that the reality of war is dirty, cold and wet, and there's damn little romance in being shot at. War is about incompetent officers, getting drunk, and the inglorious and very messy deaths of your buddies. The legends embodied by Sergeant York and John Wayne were liars. To be sure Mauldin wasn't a lone voice in the wilderness. There was All Quiet on the Western Front, there was Ernie Pyle, there was newsreel footage. But Mauldin somehow made it all seem so much more real. He was literally drawing cartoons in a foxhole. His cartoons were the product of a dogface, not a reporter at the sidelines, not an artful statement on war made from an armchair. There was no wiggle room, no dissenting opinion -- it was reality and it wasn't pretty. What's perhaps most amazing is that Mauldin's cartoons made it into our daily papers at all. Other G.I. cartoons appeared in the papers back home, but they were all heavily sanitized, like Sad Sack and Private Breger. Mauldin's cartoons, hated and actively suppressed by military brass, frequently off-color, often featuring the blackest of black humor, should by rights have never made it to the American public. But they were just that good -- like manifest destiny there was just no stopping them. This impressive two volume set reprints all of Mauldin's wartime cartoons, or at least all that the editor has been able to find. Some of Mauldin's work, especially the early stuff, is extremely rare, in some cases perhaps no longer in existence. Much excellent material, often in the form of original art, was gathered from the Library of Congress. A short and lively introduction begins volume one, but the vast majority of the whopping 692 pages are Mauldin's cartoons. And what cartoons! I was certainly familiar with the later material, the cartoons that saw print in the States, but had no idea that Mauldin had this quantity of cartoons published earlier on. Mauldin's early work uses a somewhat slicker style that his later, grittier, cartoons. It was a surprise to me that Mauldin was an absolute wizard with zipatone, a technique he later abandoned (perhaps out of necessity -- how do you get a supply of zipatone in an obscure Italian village?). His earlier stateside work, focusing on barracks life and going on maneuvers, is of course not as interesting as the later material. It has a charm that bespeaks his own innocence, soon to be dashed in Europe. 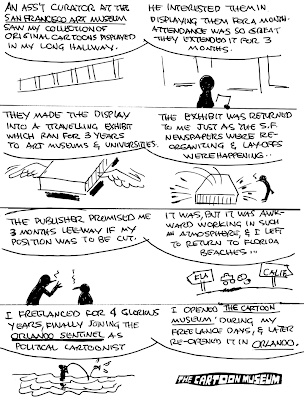 The later work is powerful far beyond my skills of description, and it is fascinating to see Mauldin's gradual growth. The reproduction of the cartoons is, by necessity, very uneven. Cartoons reproduced from cheaply printed base newspapers are, of course, sometimes a bit of a mess. Luckily editor DePastino had phenomenal luck in finding many originals from which to reproduce, so while some cartoons are a muddy mess we can see originals of many others from the same period for comparison. Even many of the cartoons printed from published sources are presented in amazingly great shape. I don't know if we have an accomplished restorer to thank or if DePastino just got incredibly lucky with his sources. I was surprised, though, to see a few of the later cartoons also printed from bad source material. Better sources are definitely available, a fact I can vouch for based just on my own collection. I was also a little disappointed that the cartoons end on July 30 1945 when there was three months left to go in the saga of Willie and Joe. 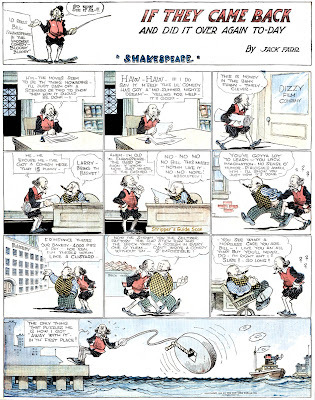 Mauldin officially retitled his cartoon at the end of October -- why not finish off the run? One nice feature that could have been presented far better are the editor's notes on the cartoons. Providing valuable background information, they are almost all quite short so there's no obvious reason why they weren't printed on the same page as the cartoon on which they comment. Instead they are printed near the back of each volume. Not at the back of the volume mind you, which would have been at least reasonably convenient, but preceding a final section of miscellaneous Mauldin art that closes out each volume. Every time you go searching for a note there's a whole lot of unnecessary page flipping involved. Most readers probably won't bother which is a shame because the notes supply some very interesting context. The presentation is delightful. The slipcase and two volumes are clad in that famous olive drab colored cloth, and the overall design is meant to evoke an old military manual. A great deal of thought and care obviously went into this presentation and it succeeds completely. The hefty price on the two-volume set, which made me think twice before placing my order, seemed downright cheap once I actually got to see the product. If you want to see the work of a man who truly did change the world, a man who finally made Americans think twice before supporting war (though apparently that lesson has faded considerably of late), this is the best and only reprint volume of his wartime works you need. Order Jim Ivey's new book Cartoons I Liked at Lulu.com or order direct from Ivey and get the book autographed with a free original sketch. PS: There will be no Stripper's Guuide posts on Monday or Tuesday. Ah, getting to the Bull Plaza Cartoon Museum days. None were finer. Craig I think the 13 Ghosts of Scooby Doo gots it beat; if I remember correctly that's going back to '85 but could be wrong.